Suez Canal - For millennia humans had wanted to cut a path through Egypt in order to open a waterway between the Mediterranean and Red seas. Records indicate that Pharaoh Nekau II at least tried, and Persian King Darius probably succeeded in digging a canal from the Nile River to the Red Sea in order to open up trade along the Indian Ocean. In more recent times, Napoleon Bonaparte tried to do the same on his expedition to Egypt in 1798 in an attempt to undermine Great Britain's hold on India. The project was abandoned, however, when a survey incorrectly determined that the two bodies of water were at different elevations. The present Suez Canal was begun in 1859 under the auspices of Ferdinand de Lesseps, a French diplomat to Egypt in the 1830s. While serving in that capacity, he learned of Bonaparte's unsuccessful attempt to build a canal and it drew his interest. His profession allowed him to forge strong relationships with the rulers of Egypt. So in 1854, he reached an agreement with Sa'id Pasha, viceroy of Egypt to build a canal (Egypt was part of the Ottoman Empire at the time and the viceroy was the sultan's governor). 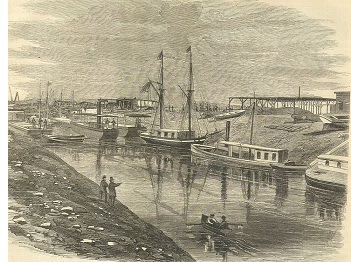 In 1858, the Suez Canal Company was formed and digging began in April the following year. The project utilized forced labor known as corvée which was condemned by several nations. Thousands of workers died. But after ten years of construction, it opened for business in November 1869. When completed it was 102 miles (164 km) long and shortened the trip around Africa by 4,300 miles (7000 km).